Trade Show and Event Materials - Flottman Company. 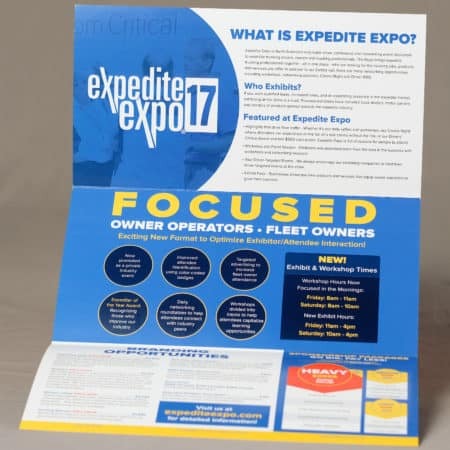 Include detailed information on the Expedite Expo trade show in a format that could be mailed to potential attendees and exhibitors; share information on all of the exhibitors to attendees at the event. Create an informational folded mailer, and a brochure directory to be handed out at the event. Both pieces communicated their messages clearly, and allowed for another successful year for the expo. Flottman Company can produce materials for your trade shows, conferences and other events. Whether you are hosting or exhibiting, Flottman can help you succeed! 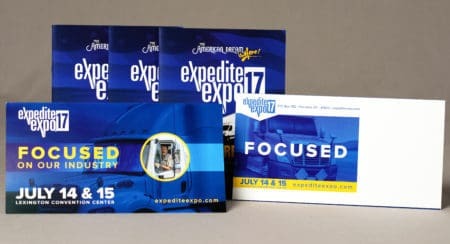 This project shows materials we produced for the Expedite Expo, North America’s only trade show, conference and networking event dedicated to expedite trucking drivers, owners and trucking professionals. The event materials included folded brochures, mailers and programs that were produced in-house. We produced a tri-fold informational mailer that was sent to companies to encourage them to exhibit. Using a folded piece allowed for more content, including information on the expo, why companies should exhibit there, an expo floor plan, branding and sponsorship opportunities and more. Mailing the piece as a postcard instead of in an envelope allowed for reduced costs. This format also allowed for maximum information to be included on the exterior of the mailer, intriguing the recipient to open the piece to read more. Mailer and brochure we produced for the Expedite Expo. Flottman Company also produced a brochure for the event. The small saddle-stitched booklet included a directory of the exhibitors as well as other important information about the expo. The brochure used a similar color scheme as the mailer, and Flottman Company was able to ensure the colors matched to create cohesively branded event materials. Are you hosting, exhibiting or attending an event? With Flottman Company as your printer, your materials are guaranteed to stand out. Request a quote today!